Below is our FOB mine price and specifications for select iron ore - subject to change. Upon review of above, should you require a full disclosure including current price quote and SGS Report, please feel free to submit your request along with contact credentials and include Proof of Funds Letter drawn on U.S. Bank evidencing value equal to or greater than intended monthly purchase. Over the last 40 years, iron ore prices have been decided in closed-door negotiations between the small handful of miners and steelmakers which dominate both spot and contract markets. Traditionally, the first deal reached between these two groups sets a benchmark to be followed by the rest of the industry. This benchmark system has however in recent years begun to break down, with participants along both demand and supply chains calling for a shift to short term pricing. Given that most other commodities already have a mature market-based pricing system, it is natural for iron ore to follow suit. 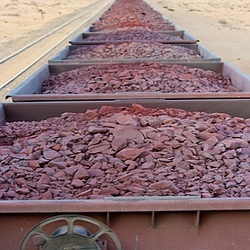 To answer increasing market demands for more transparent pricing, a number of financial exchanges and/or clearing houses around the world have offered iron ore swaps clearing. The CME group, SGX (Singapore Exchange), London Clearing House (LCH.Clearnet), NOS Group and ICEX (Indian Commodities Exchange) all offer cleared swaps based on The Steel Index's (TSI) iron ore transaction data. The CME also offers a Platts based swap, in addition to their TSI swap clearing. The ICE (Intercontinental Exchange) offers a Platts based swap clearing service also. The swaps market has grown quickly, with liquidity clustering around TSI's pricing. By April 2011, over US$5.5 billion dollars worth of iron ore swaps have been cleared basis TSI prices. Singapore Mercantile Exchange (SMX) has launched the world first global iron ore futures contract, based on the Metal Bulletin Iron Ore Index (MBIOI) which utilizes daily price data from a broad spectrum of industry participants and independent Chinese steel consultancy and data provider Shanghai Steelhome's widespread contact base of steel producers and iron ore traders across China. The futures contract has seen monthly volumes over 1.5 million tonnes after eight months of trading. The vast majority of liquidity in iron ore derivatives is based on the two Singapore exchanges; SGX and SMX. This move follows a switch to index-based quarterly pricing by the world's three largest iron ore miners - Vale, Rio Tinto and BHP Billiton - in early 2010, breaking a 40-year tradition of benchmark annual pricing.